I was googling around for pictures of Satan the other day for the Satanic Verses post, and found myself at the Art Renewal Center, which, to be fair, is an extremely good source for pictures of fine art. In fact, I think I’ve been there before and assumed that was their entire raison d’être. But no: they have a Higher Mission. For over 90 years, there has been a concerted and relentless effort to disparage, denigrate and obliterate the reputations, names, and brilliance of the academic artistic masters of the late 19th Century. Fueled by a cooperative press, the ruling powers have held the global art establishment in an iron grip. Equally, there was a successful effort to remove from our institutions of higher learning all the methods, techniques and knowledge of how to train skilled artists. Five centuries of critical data was nearly thrown into the trash. It is incredible how close Modernist theory, backed by an enormous network of powerful and influential art dealers, came to acquiring complete control over thousands of museums, university art departments and journalistic art criticism. We at the Art Renewal Center have fully and fairly analyzed their theories and have found them wanting in every respect, devoid of substance and built on a labyrinth of easily disproved fallacies, suppositions and hypotheses. If, dear reader, you are not already one of their propaganda successes, I encourage you to read on. For the sake of the children! Will no-one think of the children? I’m impatient with many aspects of contemporary art myself. But the rhetoric here is priceless. There’s only one possible explanation for the shift in direction of art in the twentieth century: a cabal of tyrannical theorists and their cowardly lackeys maliciously distorting the world art market for their own dubious reasons, and remorselessly stamping out anyone who is found committing thought crimes. The general drift of this – that modern art is all Emperor’s New Clothes, that it is imposed from above by an elite consisting of Charles Saatchi, Nicholas Serota and that guy who faked the moon landings, and that it has lost touch with what real people like – is a commonplace of tabloid journalism. But seeing it spelled out so vehemently and explicitly crystallises just how silly it is. After all, at no point in the past century has it been illegal to paint, print, sell, exhibit, write about, or otherwise promote whatever kind of art you want. If non-representational art has become mainstream, it can hardly be put down to a conspiracy. And it genuinely is mainstream; the majority of people may still be sceptical about stuff at the bleeding edge of contemporary art, but artists like Picasso and Matisse are as big a commercial draw as any of the Old Masters. But to appreciate the full glory of the Art Renewal Center, you have to get to the part where they name names. As you read, you will be seeing images of masterpieces by some of those artists whose names and art were so ruthlessly maligned: William Bouguereau, John William Waterhouse, Sir Lawrence Alma-Tadema, Leon L’hermitte, John William Godward, Edward Coley Burne-Jones, Jules Joseph Tissot, and Frederick Lord Leighton, amongst others. All giants in their lives, they were amongst history’s greatest, yet prior to the last fifth of the twentieth century, virtually no mention or knowledge of their work was being taught, analyzed or exhibited anywhere. The ARC isn’t a refuge for people who dislike Jake and Dinos Chapman, or Marcel Duchamp, or Jackson Pollock; or even Kandinsky and Picasso. Nothing so obvious. No, it’s for people who think that the great tradition of Western Art was fatally undermined by Corot, Renoir, and Monet. It’s for people who think that the Pre-Raphaelites were better than the Impressionists. I actually rather admire them for that. The obvious division might be between representational art and abstract art; to draw your line in the sand between the classical/academic tradition and the Impressionists is much more radical and much less crowd-pleasing. They are, however, obviously wrong. It’s an interesting issue, though. Even if you aren’t willing to reject all art from the Impressionists onwards, there remains the point that, at the same time as the Impressionists were painting their splodgy pictures of haystacks and canals, there were plenty of artists painting in the academic style. They were continuing the tradition that had served pretty well for several centuries; they may not have been at the cutting edge, but there were many talented painters among them. Are we (by which I suppose I really mean: Am I) too quick to write them off as vapid and uninteresting? Well, it’s always good to examine your prejudices and usually a mistake to write off whole artistic movements wholesale. But the more I browse around the ARC site, looking at the images of ruthlessly maligned masterpieces, the more inclined I am to think I was right to start with. Starting with the Pre-Raphaelites; it’s striking how little of the nineteenth century there is in their work. It’s all Greek myth, knights in armour, or harems. Even the paintings that aren’t set in an exotic locale seem to take place in some kind of never-never land where the women drift around gracefully around in culturally non-specific flowing robes. In a century of urbanisation, industrialisation, increasing democracy, non-conformist religion and empire, the paintings seem wilfully disconnected from the broader culture. So how is that different from Botticelli painting the Birth of Venus? Well, in the Quattrocento, the revival of classical culture was hot. It was one of the core ideas driving the culture forward. I am a great believer that cultures have a sort of pulse; at any given time, there are certain art forms or media or genres which are a focus of creative energy. Then, after a while, for reasons that may or may not be obvious, the pulse moves on to something else. That doesn’t mean people suddenly stop producing work in the old form, but the dynamism and cultural relevance, the snap, crackle and pop, has gone. You can see this happening in an accelerated form in the last hundred years of popular music. Jazz had a good run of thirty or forty years when it was at the cutting edge of Western culture, but eventually it died. That doesn’t mean people stopped making it, or performing it, or going to concerts, but it became a heritage activity like renovating classic cars. The same thing happened to rock, and to soul; for some time, hip-hop has been the world’s most vibrant popular music form, but it’s been around for thirty years now, and has, perhaps, run out of ideas. Fashions in popular music are just ripples on the cultural surface, of course. Other shifts are bigger and slower. One of those was the classical revival we call the Renaissance, which reshaped the literary, artistic and architectural vocabulary of Europe for centuries. And, you know, it had a good run. From the late fifteenth to the seventeenth centuries it was the only game in town; by the eighteenth it had reached its most polished, refined, and bloodless form, and it’s starting to feel like a mannerism or a habit. So you get the debate about Ancients v. Moderns, the invention of the Gothick, and people writing poems ‘as far as was possible in a selection of language really used by men’. And like the poets and novelists and architects, the painters had to find new ways of doing things which were more in tune with the times. It’s questionable, of course, how much the tradition had really been based on classical models – there are, after all, very few surviving paintings from ancient Greece or Rome – but still, there were a whole bunch of habits associated with Renaissance art, like history painting, figures in ‘classical’ drapery, personifications of abstract qualities and so on, which had once been fertile sources of ideas but now needed to be thrown aside like a squeezed-out tube of toothpaste. Indeed, the Pre-Raphaelite Brotherhood obviously understood that on some level, since despite the ARC championing them as the finest products of the academic tradition, they were actually rejecting most of it; they were medieval revivalists. Hence the name. But their solution was no improvement. They adopted some of the qualities of late medieval/early Renaissance painting, but never made any more of it than a decorative style. It’s all petals and no backbone. There was no organic connection to the broader culture. The nineteenth century was dynamic, fast-moving and chaotic; and if there’s one thing Pre-Raphaelite work is not, it’s dynamic. And it sounds very plausible. But I just don’t think it’s true. Changes in artistic fashion may seem arbitrary and superficial, but they are indicative of something deeper. You don’t have to slavishly follow fashionable taste, but you need to take it seriously. If your poetry reads like it was written a hundred years ago, that probably means there is something wrong with it. Of course you might be ahead of the curve. It might be that we’re due a change, that the tide is turning, that the pendulum is going to swing back, that everyone else will catch up with you later. But be warned: it’s probably not going to happen. People, like the Pre-Raphaelites, try to stage revivals all the time. Usually the tide is not turning, and you’ll just end up looking like a bit of a Cnut. 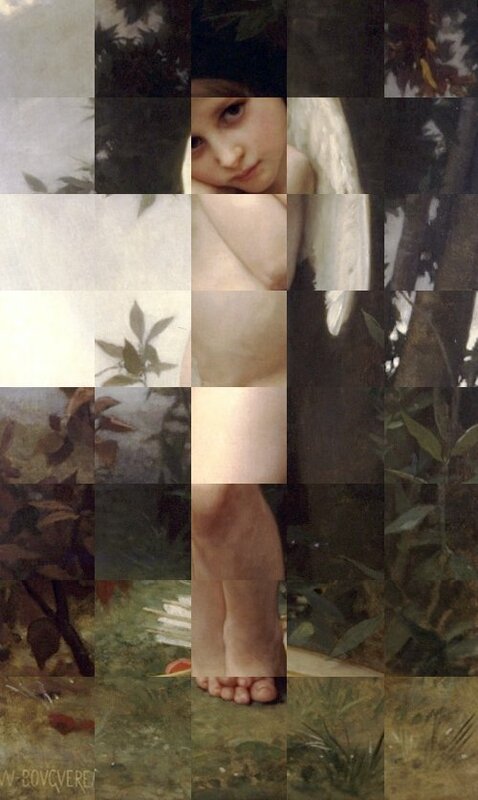 » The sliced and diced pictures above are all by William Bougereau, the favourite artist of the ARC. I particularly like the bit where they say “Considering his consummate level of skill and craft, and the fact that the great preponderance of his works are life-size, it is one of the largest bodies of work ever produced by any artist. Add to that the fact that fully half of these paintings are great masterpieces, and we have the picture of an artist who belongs like Michelangelo, Rembrandt and Carravaggio [sic], in the top ranks of only a handful of masters in the entire history of western art.” Because, of course, greatness is best measured by the square inch. It isn’t illegal to make independent films either, and no goons are going to knock down your door if you do, but try to get a film distributed, or even screened. It takes, well, money and power. If you want to understand how money and power operated to skew tastes in both the academy and the general public when it comes to art and literature, read Frances Stonor Saunders exhaustively researched and undisputed The Cultural Cold War, which was published in England by Granta Books under the better title: Who Paid the Piper? The CIA and the Cultural Cold War. It is about access. About “greenlighting” and supporting certain kinds of work (containing certain kinds of aesthetic/political content) and starving others. It’s about soft censorship and control by those who have the — sorry to be redundant — money and power. Your sneering tone is precisely the tool used to prejudge works that are not “allowed in” to galleries, magazines, museums. Do you think that the products of artists; i.e. culture itself, is so powerless that rulers would not attempt to control it? Read a little bit of history, just a little bit. Or is your point “It can’t happen here?” Fact is, it already has. Read Stonor Saunders. Oh, don’t be such a kill-joy. I do appreciate that I glibly skipped past a serious argument about art, access and power which merits rather more thoughtful commentary. Despite which, I think there’s plenty about the Art Renewal Center that makes it a fair target for mockery. So *brrrrrrrr-rrp* to you to. Some weeks ago, I liked the cover of a library book, googled it, and stumbled on ARC. 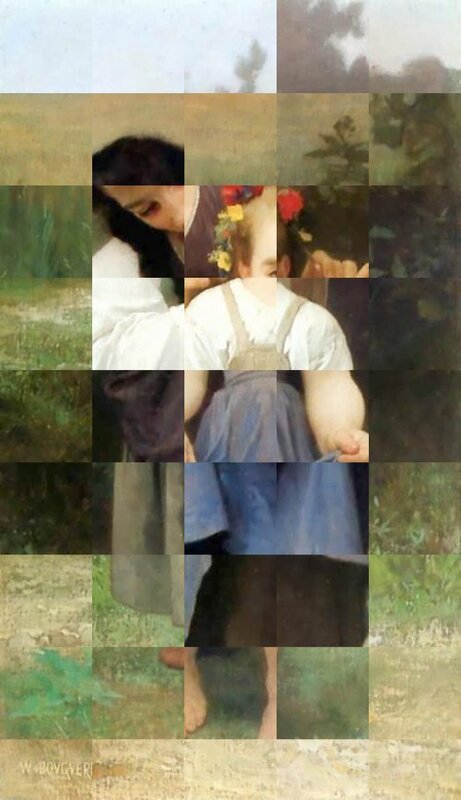 The cover was a detail from Bourgeureau’s “Idyll.” I used the painting as a screen-saver for a while, but soon got tired of it, and took it down. Is that a non-verbal criticism of Bourgeureau and his school of French academic painting? I agree with your general argument, about the need for artists to respond to the pulse of their age, and not to hide behind a traditional style. Otherwise they risk becoming irrelevant, parodic, or sterile. However, I wonder if there is another reading of the Pre-Raphaelite Brotherhood. The Wikipedia entry gives some idea of their plan to reform their age’s artistic method and taste; they did not think of themselves as conservative. In reaching back to medieval spiritual and artistic values, they were responding/reacting to what they saw was the age’s drive towards mechanization and materialism. My very imperfect analogy is this: Matisse responded to the wars and violence of his time by painting oases of serenity (for instance, Red Studio), unlike Picasso who confronted the barbarism head-on. Is Matisse necessarily the smaller artist because of this? When the Pre-Raphaelites, reacting against the dynamism, pace and chaos of the C19, chose to paint medieval settings of great stillness, detail and complexity of composition, were they being escapist or utopian, proposing an alternative social ideal? Or, the easy answer, both? The Romantic revolt, of which the Pre-Rahaelites were a part, was an understandable and authentic response to the social upheaveals and altered landscapes of the Industrial Revolution. But thankfully it wasn’t the only reaction! The ARC’s rhetoric reminds me a lot of the polemics from the neo-formalist poets here in the U.S., some of whom are actually quite good. (They’ve had the sense to move toward less regular rhythms and more frequent enjambment than, say, Tennyson.) I just don’t understand why there has to be a one best way of painting or writing poetry. I don’t happen to like a lot of the high modernist poets – much of the work of Pound, Eliot, Stevens, Mina Loy and Marianne Moore strikes me as arid and over-intellectual. And from my perspective as a greenie, the urban-technological utopianism of the early modernist movement in art and architecture is pretty repugnant. But then agan, as you say, the art we remember is generally the stuff that reflects the zeitgeist. The fact that we have seen so many gifted nature poets emerge in the last thirty years, for example, simply reflects the growth of the modern (postmodern?) ecological consciousness. Anyway, that’s a little off-topic. Thanks for a fun post. Perhaps utopianism is inherently escapist. The whole idea of a cultural pulse reeks of hindsight, of course. We say in retrospect that a certain kind of art was right for a historical moment because we value the work produced. Coming up with a justification for why it was right for that moment is the easy bit. In which case there’s a simpler explanation for any inadequacies of the PRB: they just weren’t good enough. If they’d just had one or two painters capable of doing great things with the material, then we [I] would look back at them differently. It’s not that I have a problem with all Victorian medievalism; I took the tour of the Houses of Parliament last year, and while I can’t say I’m entirely comfortable with the symbolism of building a parliament building in a medieval style, there’s no doubt that it’s a magnificent piece of work. It’s tempting, and possibly equally specious, to make another sweeping generalisation and say the Victorians just weren’t very good at tasteful and elegant; they were at their best (and worst) when they were loud and brash. The Pre-Raphaelites aimed for elegant and only managed fey and kitschy. I thought of the neo-formalists myself while I was writing this. And much as I like formal poetry myself, I do think that a lot of the rhetoric associated with the movement is deeply peculiar and more likely to prevent people writing good poems than enable it, because it’s too easy to make a rejection of contemporary poetry into a rejection of contemporariness, and to inflate the importance of rhyme and metre over everything else that makes up a good poem. Whether neo-formalist poets actually produce more or less good poems per thousand than their avant-garde and mainstream counterparts is probably impossible to measure. WTF THIS IS NOT FUNNY?!?!?! Love your take on The Art Renewal Center. My comment is above. I am a painter in the ersatz post colonial revivalist tradition. In other words I have no idea what I am doing or where it fits in other than I like, as did Degas painting prettry women in pretty costumes. It was a great explanation of the ebb and flo of art movements.